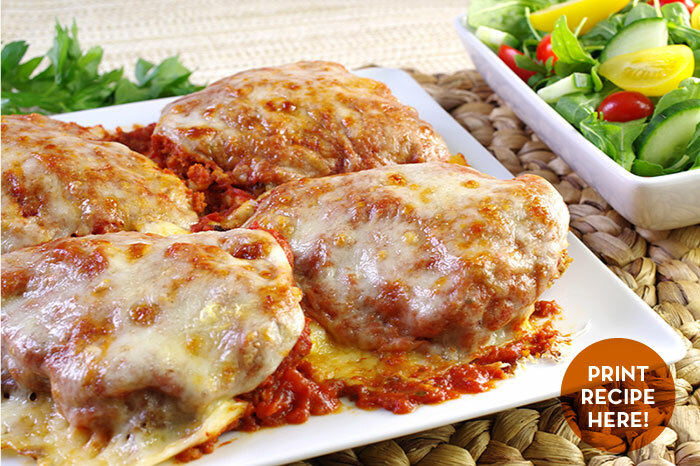 Chicken Parmesan is one of those classic Italian-American dishes, a favorite of pretty much everyone with taste buds. I often feel guilty scarfing down restaurant versions, though, since they’re usually deep-fried and smothered in cheese. Luckily, the homemade version doesn’t have to be quite so caloric. 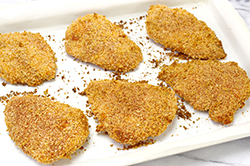 Instead of frying, we’ll bake our chicken in a crisp panko coating; that way we won’t have to think twice about loading on the cheese. Heck of a compromise, if you ask me. Pasta is the traditional accompaniment to Chicken Parmesan, but a green salad and some toasted, crusty bread are also great alongside. 1. Preheat oven to 400°F with a rack in the upper third. Generously mist a sheet pan with cooking spray. 2. Stir together the panko, garlic powder, oregano, paprika, and 1/2 teaspoon of the salt in a large bowl to combine. In another large bowl, whisk together the flour, the remaining 1/2 teaspoon salt, and the pepper. In a third shallow bowl, whisk together the eggs. 3. 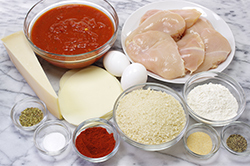 Dip each chicken cutlet first in the flour mixture, shaking off any excess, then in the eggs, and finally in the panko mixture, patting to coat thoroughly on both sides. 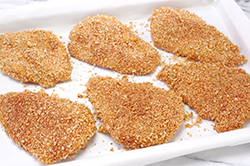 Place the breaded chicken cutlets on the prepared pan. Mist the chicken with cooking spray to lightly coat. 4. 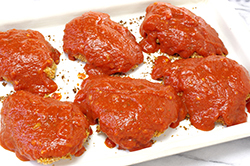 Bake the chicken until the panko has browned and the cutlets are almost entirely cooked through (they’ll no longer feel squishy when you poke them), about 15 minutes. 5. Remove the pan from the oven. 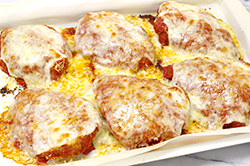 Top each chicken cutlet with about 1/2 cup marinara sauce (use up the jar) and the provolone and Parmesan, and return to the oven. 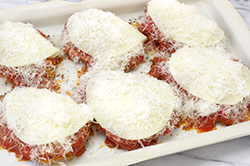 Bake until the cheese is melted and bubbly, an additional 10 minutes. Reprinted with permission from Sheet Pan Suppers by Molly Gilbert. Copyright 2014. Published by Workman Publishing Company, Inc., New York, NY. All rights reserved.